One of just a handful of options available to executive leadership when their company or its products reach life cycle maturity, Breakthrough Innovation is the proven path of renewal, the opportunity to survive and thrive in a significant way. Yet, Breakthrough Innovation is only half of the innovation equation. A complete portfolio includes investment in both Incremental Innovation (which optimizes within the existing paradigm) and Breakthrough Innovation (which changes the paradigm within which competition occurs). When implemented effectively, Incremental and Breakthrough Innovation work together to enable the company to both survive in the near term and thrive over time. Having decided to invest in Breakthrough Innovation, executive leadership must develop sufficient insight to do so wisely. Unfortunately, the most commonly held views on innovation, that it is either random or recipe, are flawed at their core and do not deliver on the promise of renewal. Instead, Breakthrough Innovation is the very human act of discovery – an act requiring a company to acquire and establish new perspectives, insights, cultural values, and business practices in order to achieve and sustain it. Only those who hold such a perspective possess the potential to succeed at Breakthrough Innovation. Finally, having understood the way of Breakthrough Innovation success, executive leadership must commit sufficiently to ensure that success. While such commitment comes in many, varied forms, it includes but is not limited to hiring the right people, providing them with resources and time, and sustaining an innovation‐friendly culture. It also requires resisting the temptation to pull these resources onto the problem of the day to extend maturity, a problem that all too often dilutes and renders useless what originally was intended as investment intended to renew the company. While such insight and investment is rare, those who rise to these expectations and challenges serve all, successfully leading their organization beyond everyone’s dreams. By Harry Moser and Millar Kelley; used with permission by Harry Moser, Founder of the Reshoring Initiative. Reshoring and foreign job announcements (FDI) surged in 2017 to over 170,000 U.S. manufacturing jobs. This is strong evidence that work can and will be successfully brought back—and is especially relevant in a time of intense debate over tariffs and the trade deficit. All told, job announcements were up 52% from 2016, and a whopping 2,800% from 2010. Announcements lead to hiring typically within 6 to 24 months. There is substantial potential for many more jobs to come back, if the right policies are implemented going forward. President Donald Trump has announced tariffs on solar panels, appliances, steel, aluminum and a broad range of Chinese products. His aim is to eliminate the $700 billion/year non-petroleum goods trade deficit, thus increasing U.S. manufacturing by about 40%--about five million jobs. Many observers question these actions based on likely retaliation and higher U.S. consumer prices. Others question the feasibility and wisdom of trying to increase manufacturing’s share of the economy by bringing back to the U.S. the industry that we have lost over the last 40 years. It is now clear that U.S. manufacturing, including foreign-owned plants, can be started up or grown to support a substantial flow of work back to the U.S.
U.S. and foreign companies increasingly recognize that it is in their interest to supply more of the U.S. market by local production and sourcing. Based on timing of announcements, much of the surge was due to the anticipation of lower taxes and regulations and higher tariffs. To bring back more than about 10% of the five million offshored jobs will require more U.S. competitiveness, more leveling of the playing field—including some combination of lower USD, stronger skilled workforce training, still lower corporate tax rates, and a VAT (Value Added Tax). Bringing so many jobs from offshore disproves the weak claim that only 4 to 13% of the decline in manufacturing jobs has been due to offshoring, with the rest to automation. If so few had been lost to offshoring, so many could not be recovered in one year. Education and skills training need to be improved in almost all regions. Skilled workforce is the third ranked driver of reshoring and FDI. Skills training is a corporate responsibility. Some companies have taken that responsibility; others have ignored it. Without a larger and better trained workforce, the flow will decline rapidly. Skilled workforce is the third highest ranked motivator of reshoring. Industry 4.0. Automation, productivity, innovation and lean collectively are the highest ranked enablers of reshoring. Have you optimized? See which industries or companies are reshoring. Join them or sell to them. Reevaluate offshoring. Recognize and quantify the frequently mentioned costs and risks. For example: quality, delivery, inventory and IP risk are often ignored when offshoring. Made in USA branding is the fourth-highest rated factor. Would increased volume and a moderately higher price cover the cost differences on some products? Read the entire article at Reshoring-Rise-What-it-Means-for-the-Trade-Debate? At some point, engineering managers will have the privilege and responsibility of being involved in strategic planning and management in their organization. Strategic planning is the process of setting up, launching, adjusting and improving a corporate-level strategic plan. Strategic management, on the other hand, constitutes the set of tools and techniques to put that strategy to work. Coming up with strong, focused strategies and executing them well is critical to the success of any organization in a competitive, global market. Engineering managers play a central role in making that happen. We, as engineers, are uniquely positioned to understand our organizations’ products and technology, and how they can fit into the bigger picture. In this post, I’ll provide a summary of Domain 3 in the Engineering Management Body of Knowledge: Strategic Planning. I’ll cover the main sections in that domain, including the planning process, strategic management, strategy formulation, and executing strategy. The first step in the strategic planning process is to understand the organization and its current state. You need to understand where you are before you can plan to end up somewhere else. Once you establish a baseline, you can launch into a “plan, do, check, act” cycle. Plan – This involves creating the organization’s mission and vision statement, understanding the relationships between the firm and its suppliers, customers, and competitors. Next, medium and short-term goals are set in order to realize the long-term vision. Finally, specific strategies (such as growth strategies, acquisitions, partnering, etc.) are chosen in order to realize the overall vision. Do – This stage is all about the day-to-day work to actually execute the strategy. This often happens in the form of projects and requires strong project management. Check – The checking process happens in parallel with the other steps, and is used to control the strategic planning and management activities. Act – This final step is to adjust work in response to having checked the work in the previous step to make sure things stay on track. Using the measurement in the “check” step above, corrective action is taken, and the PDCA cycle starts again. Strategic management is about implementing strategy and making changes as problems and opportunities arise mid strategic-planning cycles. The tools and techniques used to do this should help make sense of the organization’s current state, what the future should look like, and how to get from the current state to the future state. CROPIS Analysis – CROPIS stands for Customers, Requirements, Outputs, Processes, Inputs, and Suppliers. An in-depth analysis of each of these elements can help to reveal opportunities for improvement throughout the organization. SWOT Analysis – SWOT stands for Strengths, Weaknesses, Opportunities, and Threats. In a SWOT analysis, an organization is looks at the good and bad in the organization’s internal and external environments. This can help an organization understand which risks and opportunities to address and how. Boston Consulting Group (BCG) Competitor Matrix Analysis – This tool uses a matrix to plot products, services, divisions and companies on two axes: sales growth rate, and market share. Products and services fall into one of four quadrants, called Stars (high growth, high market share), Cash Cows (low growth, high market share), Dogs (low growth, low market share), and Question Marks (high growth, low market share). Understanding what quadrant your products or services fall in can help you understand what to do with them in order to improve your company and help it meet its strategic goals. The Product Life Cycle Model – All products progress through a life cycle. They move from introduction to growth, maturity, and decline. 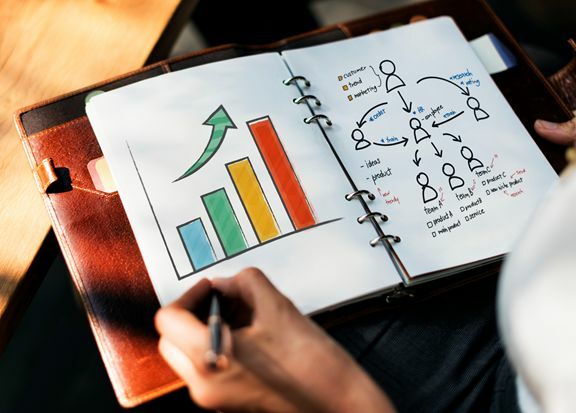 Understanding which phase your products are in will inform how you treat those products and what kind of investments you make in them – a brand new product needs to be treated differently than one that is in decline, but both can help the company reach its goals if treated properly. Numerous models can be used to understand an organization’s strategic environment, including the SWOT analysis and BCG matrix described above. Porter’s Five Forces – Michael Porter’s Five Forces model distills what an organization needs to consider with respect to the formulation of strategy into five elements: rivalry among existing firms, threat of new entrants, buyer power, supplier power, and threat of substitute products. All of these forces need to be evaluated in order to know where a firm should go with its strategic direction. Porter’s Generic Strategies – Michael Porter also developed a series of generic strategies that companies can use as starting points for understanding how they should position themselves in the market. Strategies can be plotted on two axes. The first axis has cost leadership (providing a product or service at the lowest cost) on one end of the spectrum and differentiation (offering something unique and valuable in the market place, which commands a high price) on the other end. The other axis deals with market focus, with a focus strategy (trying to appeal to a specific, niche market) on one end, and a global focus (selling to a broad market) on the other. Core Competence Strategy – The core competence strategy focuses an organization’s business activities on areas of expertise that would be difficult for competitors to replicate. This strategy grew in response to the failure of vertical integration strategies that had worked so well previously. Services-Based Strategy – Many companies in the West have started making moves toward becoming more service-based than manufacturing-based. This is in response to the dominance that regions outside the West have enjoyed in manufacturing in recent years due to lower worker wages. Companies such as IBM, who used to focus their attention on hardware and computer products, now offer services such as consulting as their main business. Joint Ventures, Outsourcing and Partnering – Joint ventures and outsourcing are two strategies that can be used to help a company compete in a market where they either don’t have all the core competencies themselves, or they are too expensive. Partnering with other companies is an effective way to leverage the strengths of both organizations. Outsourcing can be a way to shift scope to another organization in order to realize cost reductions, take advantage of special capabilities, or shift risk. Partnering is sometimes achieved through joint ventures, and other times through acquisition. Once a strategy has been established, it needs to be put into practice. This can be either in the form of permanent teams that take care of ongoing operations, or special teams organized to achieve a one-time objective. Regardless, teams need to be clear on their mandate, and be comfortable and competent at leading change. The Strategic Planning domain covers topics that are critically important to organizations of every size and in every industry. When an organization is technical, engineering managers play a vital role in the formation and execution of the company’s strategy. Developing a strong sense of strategic management and the tools used to develop and implement strategy can be very beneficial to both the engineering manager and the organization as a whole. Business savvy engineers are found at all levels within an organization. Last month, we learned that engineering managers are charged with planning and organizing work, allocating resources, and directing and controlling work activities. In this post, we will drill down into the management skills, tools, and philosophies that a business savvy engineer needs to lead, direct, and organize resources effectively. In Chapter 2 of the EMBOK, we are introduced to the Integrated Management Model. The external environment is made up of customers, competitors, suppliers, vendors, and regulatory agencies. The internal environment, on the other hand, includes all of the company’s staff, assets, and special capabilities. We’ll dig deeper into the management systems, organization structures, and people orientations at the heart of the integrated management model. Most leadership training programs today fully endorse the idea of motivation over punishment of workers. You know the old adage that you get more with a carrot than a stick. Thus, it is helpful for business savvy engineers to be familiar with the major philosophies and teachings regarding motivation. First, Douglas McGregor proposed that managers make assumptions about workers which translate into behaviors. Theory X is one in which managers assume workers are lazy, would rather be doing something else, and all they are about is their paycheck. Theory Y managers, instead, assume workers are dedicated to the organizational goals and will act in ways to achieve these objectives. Fortunately or unfortunately, our expectations often result in the outcome we support. Next, Frederick Herzberg proposed that a manager can motivate workers to higher levels of performance through a two-factor model. He identified minimal elements of a job that must be present to prevent worker dissatisfaction. These are called hygiene factors and include safe working conditions, relationships with supervisors, and fair pay. While Herzberg identified that the presence of hygiene factors prevents dissatisfaction, these elements do not motivate workers to higher levels of performance. In contrast, motivating factors are often the least expensive for a firm to provide and will yield higher dedication to organizational goals. These motivators include recognition, advancement, and responsibility. Finally, psychologist BF Skinner’s behavioral research demonstrates that behavior that is rewarded will be repeated while behaviors that are ignored will be extinguished. 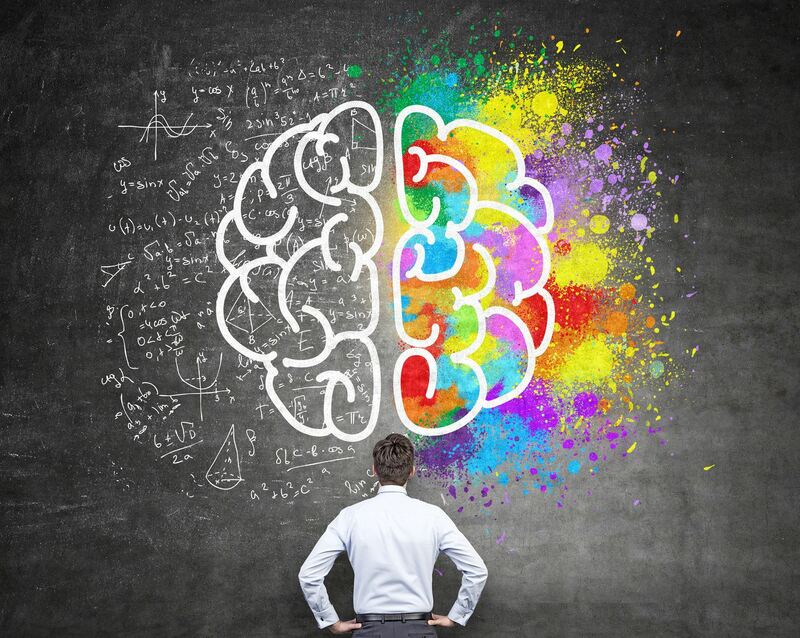 When leaders combine McGregor and Herzberg’s motivational theories with Skinner’s Operant Conditioning Theory, we - as leaders - are empowered to improve working environments for engineering and knowledge workers. We also learn about ourselves and can improve our own management skills. Business savvy engineers innately understand that cross-functional teams improve the effectiveness and efficiency in achieving project objectives. Henry Mintzberg identified five basic organizational structures composed of the operating core, middle managers, upper management (called the “strategic apex”), technical support, and traditional support functions. The relative power, influence, and concentration of these groups determines the speed of decision-making in an organization. The organizational structure must align with the firm’s strategic objectives in order to deliver long-term value. Team structures may change with the maturity of an organization and/or the complexity of the project work as well. Of course, no project or engineering work is done without people. Business savvy engineers will recognize that they will need to adjust their leadership style to suit their environment. For example, global teams include people from both high context and low context cultures. In a high context culture, relationships reign supreme, while task completion takes center stage in low context cultures. Engineering managers must negotiate a balance between team member needs and work performance. If conflict arises, managers often act as mediators. In this role, the engineering manager must ensure both sides are able to share their positions and s/he can negotiate an equitable outcome that allows the team to move forward. Chapter 2 of the EMBOK presents a conflict model that illustrates the need to address issues as they arise, not allowing them to fester under the surface. Furthermore, learning to apply conflict resolution and negotiation skills can benefit an engineering manager both inside and outside of the work environment. Chapter 2 of the EMBOK is packed with management and leadership theory that has stood the test of time. Engineering managers bridge external and internal environments and understand their role in team motivation. Creating the right organizational environment to empower people across all cultures leads to a satisfying and rewarding career. Next month, we’ll delve into the role strategy plays for an engineering manager in a leadership position. In the meantime, if you’d like to read the previous posts in this series, click here and you can learn more about becoming a Certified Professional Engineering Manager here. Teresa Jurgens-Kowal is a Certified Professional Engineering Manager (CPEM) with a passion for lifelong learning helping individuals and companies achieve strategic growth through Global NP Solutions. You can connect with Teresa on Linked In. As the year progresses, I continue to be excited about all the great work the ASEM Board continues to do on behalf of our members. We have accomplished many key initiatives that will continue to distinguish ASEM and provide value for the membership, which includes: The transition of the new editorial team for EMJ; update of the strategic plan and key performance indicator metrics for the Society; development of director goals that tie to performance indicators; development of EMBOK PowerPoint slides to support professional training or use in the classroom; the practice periodical continues to evolve and provide relevant information for EM practitioners; completion of a very successful conference in Huntsville; and finalized plans for upcoming conferences in Coeur d’Alene (2018) and Philadelphia (2019). There is plenty to look forward to this spring – and it’s not too late to get involved. There are two calls for papers with deadlines fast approaching: the deadline for the 2018 International Joint Conference in Europe is March 3, 2018; and deadline for the ASEM 2018 International Annual Conference has been extended to March 5, 2018. In all of the hustle to prepare for the conferences, don’t forget to submit your chapter and section reports and your nominations for Engineering Manager of the Year Award by the end of March. We have two critical leadership opportunities available and we are soliciting interested candidates. The positions are for the Associate Executive Director and the SW Regional Director. Members who are living in the South West Region can expect to see a ballot coming their way soon. We have a lot going on that represents many opportunities for your involvement and talent sharing. Early Saturday morning on October 21st, the Empowering Women as Leaders in Systems Engineering (EWLSE) sponsored technical workshop Leading and Managing System and Specialty Engineers was delivered at the American Society of Engineering Management (ASEM) annual conference in sweet Huntsville, Alabama. 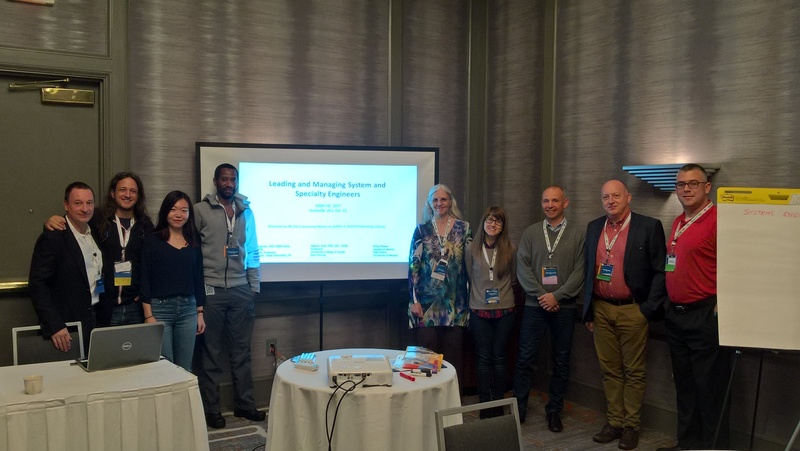 The workshop, developed by Alberto Sols, Alice Squires, and Erika Palmer, addressed three major topics for technical managers of systems and specialty engineers: Part I) Technical Competency, Part II) Diversity and Team Building, and Part III) Processes and Policy. Part I results included the identification of two common roles between systems and specialty engineers: systems thinker and effective communicator. Traits associated with the systems engineer role included leadership, adaptive learner, technical breadth, knowledge management, systematic, mindfulness, and patience. Traits associated with the specialty engineer included technical knowledge, analytical skills, teamwork, accuracy, and self confidence. 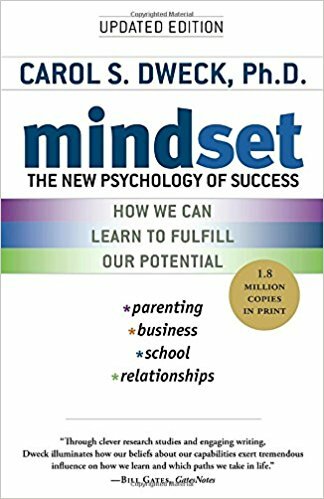 Results for improving traits focused on intention and commitment as well as recognition of ignorance and the desire to improve. Part II results included the recognition that diversity, discrimination, and expectations differ between countries, and that while age and gender are visible, mindset and values are invisible, and culture is in some ways visible and in other ways invisible. One participant raised the point “Do you want to sacrifice efficiency for effectiveness, when you communalize a model you eliminate diversity.” Pros and cons related to building diverse teams were discussed with pros including new and diversified ideas, varying experience, balance, and innovation and with cons focused on challenges with communication and what type of communication is best depending on individual preference and styles (direct versus subtle). The discussion about leveraging diversity in teams focused on the importance of openness and adaptability, matching people to what they are naturally good at while also giving them a stretch goal and providing higher opportunities for self-development, being knowledgeable of and avoiding micro-aggressions, and getting the best out of everyone, but also raised the question as to whether or not we were coming from a perspective of privilege focused on how we can leverage diversity to provide value to ‘us’. The team decided that positive goodwill, intention, authenticity, empathy, and respect from the heart were what was important and everything else (such as miswordings or potential biased actions) can be overlooked when these positive factors are clearly present. Some things we can do are ask people about needs and expectations, listen to the answers, show we care, be respectful, and, as always, lead by example. For Part III the group reviewed a case study and developed a Strength, Weakness, Opportunity and Threat (SWOT) matrix with recommended actions for the systems and specialty manager for the case presented. These actions, applicable to most organizations, focused on generating awareness and building demand for systems engineering in the organization, filling the gaps and areas of expertise that are missing in both the system and specialties area, and focusing on the link between training, tools, and processes. Interested in learning more? The outcomes of the ASEM 2017 workshop are included in the attached set of workshop slides. Enjoy!